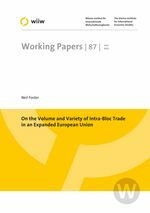 This paper examines the development of exports within the expanded European Union over the period 2000-2007. The paper addresses the issues of how and why within-bloc exports have developed following accession. The paper shows that exports within CEFTA and within other accession countries have grown more quickly than those between old EU members, but that after accounting for traditional gravity determinants there has been no significant change in this behaviour following accession in 2004. As such, this is likely to reflect a natural realignment of trade patterns following the communist era, as well as the relatively stronger performance of the new entrants when compared with existing EU members. The results also indicate that much of the increase in exports within the accession countries has been due to an increase in the variety of products traded, rather than an increase in the volume of existing products.